We are counted amid the notable Manufacturers, Exporters and Suppliers of Heating Mantles from Pondicherry, India. 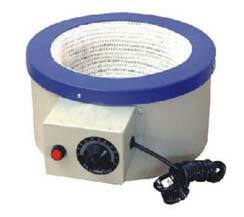 Made from specially selected materials, our Heating Mantles can endure high degree of temperature. Our sturdy Heating Mantles can be made available in various sizes and other specifications for various applications. Our Heating Mantles are reasonable priced as compare to the ones generally available in the market. A heating mantle or isomantle is a piece of laboratory equipment used to apply heat to containers, as an alternative to other forms of heated bath. In contrast to other heating devices, such as Hotplates or Bunsen Burners, Glassware Containers may be placed in direct contact with the heating mantle without substantially increasing the risk of the glassware shattering, because the heating element of a heating mantle is insulated from the container so as to prevent excessive temperature gradients.